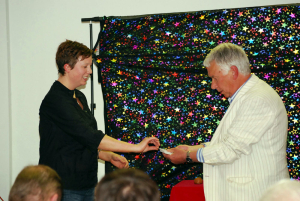 Richard Ballinger’s close up magic tricks have been impressing audiences across the South West for more than 25 years making him one of the region’s most experienced close up magicians. A close up magician makes all the difference to your event with their combination of sleight of hand and mind-reading tricks providing an excellent ice-breaker encouraging guests to mix and mingle. Richard’s close up show amazes, mystifies and, most of all, amuses giving guests something to talk about – just read what clients think of his act on his Testimonials page. His close up magic combines card, coin, origami, wallet and watch tricks providing a mini-cabaret show which is suitable for adult, childrens and family audiences and can be tailored in length to suit your event. His act is perfect for events ranging from anniversaries, balls, christening and engagements through to corporate events, parties, restaurants and weddings. Richard is a close up magician who will leave every one of your guests with a unique memory of your event. Have a look at the video below to see Richard perform a close up illusion. Christening, The Royal Hotel, Weston super Mare. The Grand Pier, Weston super Mare. So if you’re looking at booking a close up magician or close up magic show for Bristol, Weston-super-Mare, North Somerset or anywhere in the South West please Contact Richard on 01934 418184 or 07979 600797. Alternatively, email him with your contact details and close magic requirements at magic@richard-ballinger.co.uk and he’ll get back in touch as soon as possible.